Erratic and inaccurate online customer reviews can cost you business. Nine out of every 10 people search the Internet to decide where to buy products and services. And most of the “trusted” user-review websites invite anyone to comment. Those comments can be placed by competitors, disgruntled employees and those just wanting to do harm. Negative reviews, unfounded or not, are damaging. 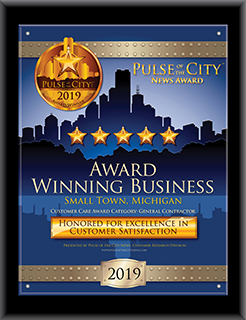 The Pulse of the City News Customer Satisfaction Award and subsequent Star Page given to highly rated companies is just what you need to help protect your reputation. Individual anonymous comments are not needed or accepted by Pulse. We base our awards on independent research. Consumers trust credible awards. In marketing campaigns across the country you see references to awards. Credible, independent, third-party awards create a comfort zone for consumers — if they know about it. It is your job and opportunity to promote your business by sharing the news of your award if you want to grow your business. We can help you do so. We congratulate you on your high rating and encourage you to browse our site to learn just how many ways the award can help you and the support we can provide your business.